Flexible and soft, this canvas ankle brace provides medial/lateral support to injured or weak ankles but is light enough to wear during athletic activity. Extra stabilization is achieved with the removable medial/lateral inserts. Lace-up design allows for a more precise fitting support. Soft canvas that contours and cradles the ankle. Breathable and comfortable ankle brace. 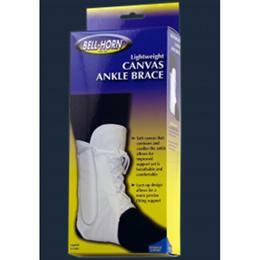 Recommended for stabilizing the ankle joint following cast removal or when severe sprains occur.